Even at a relatively low background level the massive Sonus faber SE speakers are immersive. The top to bottom tonal balance is so engaging, it’s tough to write, or even have a conversation while they are playing. These speakers truly take your breath away, even before you turn the music on. Even at a modest level the SEs captivate instantly, as Bos Scaggs’ silky voice slowly folds into the mix of “Harbor Lights,” a track I’ve easily heard a thousand times over the years. For speakers with such a massive physical presence, the delicacy that they deliver is almost tough to describe, it’s so seamless, effortless and with such gentle gradation when the program demands it, yet equally forceful when that is required. Powered by a full Burmester system, with bridged 909 Mk.5 power amplifiers for each SE (delivering nearly 2000 watts per channel) there are no dynamic restrictions here. And this is only a hint of what is to come. 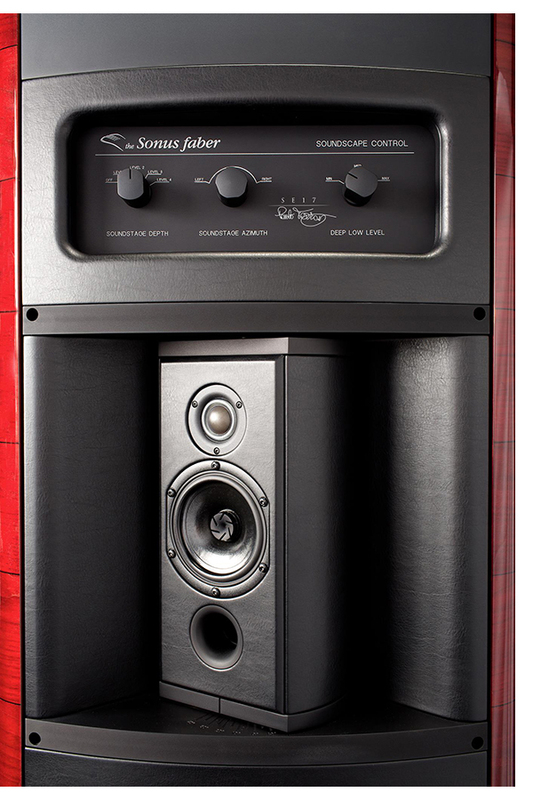 The Sonus faber website says that the SE “is a limited edition masterpiece, available only by special request from premier clientele.” There’s a handful of Sonus faber dealers that you can purchase the Aida’s from, but if you want the SE, there’s only one place – LMC Home Entertainment in Scottsdale, Arizona. Owner Mike Ware is your steward to Sonus faber’s finest, and one of the top hifi dealers in the world. Ware says that his team will install and setup the SEs anywhere in the US, so you won’t have to worry about trying to move these on your own. Ware and his highly trained staff will leave nothing left to chance. So, it made way more sense that I get on a plane and head out to see Mike. No one wants to see a pair of beauties like this get a nick, dent or scratch from shipping. Trading Portland for Scottsdale in January is not a bad idea either. Having extensive experience with Burmester gear, also having spent time with the Sonus faber Aida a few weeks earlier, LMC’s Mike Ware saved me a ton of setup time. His main room, which measures about 25 x 40 feet, proves a much better venue for a speaker this size than my 15 x 26 foot room. Speakers this big really do need a big room to open up into. Ware has the SE’s installed in the room about 15 feet apart and about 5 feet from the side walls, with three rows of slightly elevated theater seats. The front row center position is about ten feet back, the next row about a foot higher and the final row another foot or so higher. Because this system recreates such a true sense of scale, and fills the room so completely, depending on the performance played, you can get the immediacy of a third-row orchestra seat, the more diffuse position of the back row, or in between. It’s impressive, the way the stereo imaging holds up no matter where you sit. 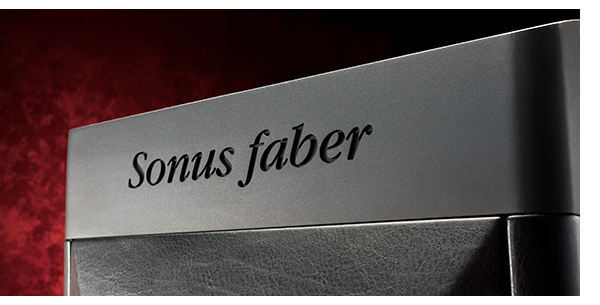 Sonus faber speakers have always offered wide dispersion in both planes. Moving back to the middle row offers a slightly more homogenous feel with more room for the bass to integrate, but these speakers disappear in the room so well, it’s tough to not go back to the immersive, giant headphone like feel of the front row. Of course, you will certainly have your own preference, should you install your own pair. The best news though is that these are by no means a one-person, small sweet spot speaker. Sitting right in the center will give obvious dividends, but even sitting on the floor, off to the side, it’s still good. For all the naysayers that a great hifi system can’t put the real thing in your room, I say shut up. There’s something so special about these speakers in a big room, it is possible to close your eyes and be there. A perfect example of this is the “Superman” track from the Crash Test Dummies first album. The SEs do such a precise job at recreating the performers, I feel just like I’m back at Portland’s Aladdin Theater, and Ellen Reid is resting her head on Brad Robert’s shoulder while singing backup. The spatial recreation is that convincing. Awesome rarely comes easy and it rarely comes cheap. It certainly doesn’t here. A pair of SEs will set you back a cool $250k. Yeah. And that probably means at least another 250 or more in electronics and wire. We can have the argument till the cows come home whether this is “worth it” or not, but the bottom line is that this is what it costs to get sound this good. The rest is whether you want to play. But what a great playground. Switching to more dynamic faire, bumping the volume on Aphex Twin’s “Minipops 67” is so much fun, even I want to get up and dance. And that’s not a medium in which I choose to express myself. Though I was given the green light to “turn it up as loud as I needed to,” the Sonus faber/Burmester combination never runs out of dynamic range, never flattening out in the slightest. The driving bass line in the Aphex Twin tracks leads me to the back side of the SE to see where the “deep low level” setting happens to be. It is on “minimum.” According to the owners manual, this controls the output of the 15-inch, side firing woofer (with 4-inch voice coil) that is crossed over to the pair of front firing 10-inch woofers at 80hz. 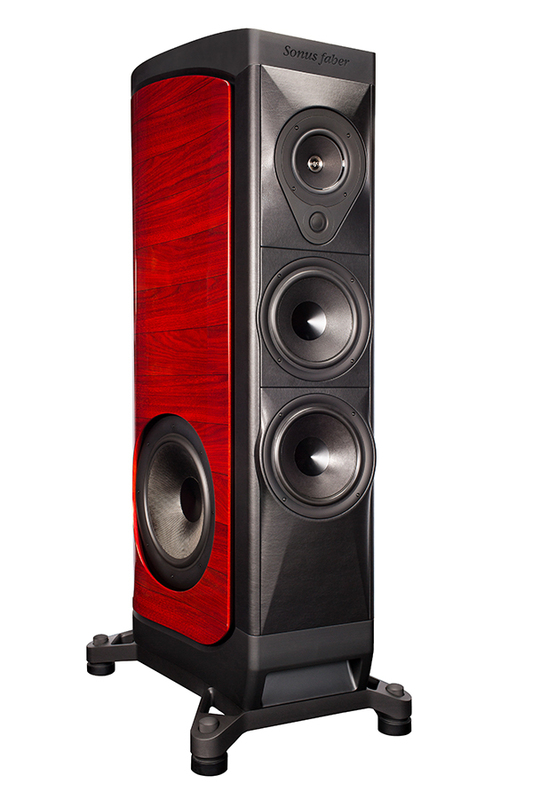 Sonus faber lists the sensitivity of the SE at 92db/1 watt, and a maximum power handling of 1000 watts. Ware confirms my suspicions, that like the Aida, these speakers will play with anything, but a reserve of clean, quality wattage helps them deliver everything they are capable of. These woofers cross to the midrange driver at 250hz, and then again to the Beryllium dome tweeter at 2500hz. There is another one of these facing back with a smaller midrange, as part of what Sonus faber refers to as a “soundfield shaper.” This feeds a bit of the main sound towards the rear wall or corner in your room, and depending on where you set the controls, can go far at expanding the soundstage. Ware had these set on the lowest setting in his room, which makes sense considering the size. The Aida has a similar setup around back, and when we had them here for review, we found that they helped integrate a large speaker into a smaller room better, but as always, experiment to find the sweet spot to taste. I’d be lying if I told you I remember all the nuances of seeing the Talking Heads on the Stop Making Sense tour back in 1981, but playing the soundtrack through the SEs feels right. Their ability to reproduce the sheer sound pressure level of the live event, with the resolution, clarity, and nuance of a world class audiophile system is better than live in my book. And the way the audience response is folded in and out of the mix, feels totally real. I found a similar effect when listening to Jeff Beck’s Live at Ronnie Scotts, as I did with a number of other favorite live recordings. The spatial presentation of these large speakers is fantastic. The energetic presentation they offer confirms a true sense of sonic reality. Sitting in the middle row of Ware’s room, the cues from people in the audience cheering, clapping, and whistling is so realistic it’s almost like listening to a full Dolby Atmos setup, not two speakers. Greg Dulli’s vocals at the beginning of Gentlemen is phenomenal. Im pulled to the edge of the seat as His textured, loud, cyring whisper drains off so gradually when he sings, “It’s in our home, baby, it’s in our bed.” Yet 20 seconds later when he begins to scream, I nearly jump out of the chair. That’s musical realism. Big dynamics are big fun, but revisiting some of my favorite Beatles, Stones and Dylan records reveals how well the SEs lock down the musical pace, almost like a small pair of studio monitors – but a lot bigger. A LOT bigger. For many audiophiles, the word detail means a sharp-edged presentation that cuts into your psyche, often revealing the music in a harsh manner, with a forward presentation. Speakers that have a softer presentation are referred to as laid back, warm, or rounded off. But imagine combining that level of detail, revealing the maximum amount of musical information in a way that is not the least bit harsh or grating, with a range of tonal scale that feels like a continuous gradation, that’s the sorcery that the SE presents. It’s like sleeping on 2400 count sheets. The resolution experienced with the SEs is not so much in an ultimate sense, but in the smoothness of gradation. Sounds faded from maximum to minimum in an incredibly linear fashion, and swelled from quiet to loud in the same way. This is the last bit of realism for me. If I weren’t listening to digital files, I’d feel almost like the music was running a tad slow, but it comes back to the way the music is rendered with such an utmost delicacy. The SEs have the necessary speed to accomplish whatever musical task is required, yet they never feel like they are “attacking the music.” The music merely swells and recedes so quickly and smoothly, there’s never any attention drawn to the speakers. That’s the highest compliment I can pay the SEs. After a really intense seven hour listening session, I never felt like I was listening to hifi, nor did I have hifi thoughts while basking in their glory. All I could think of was what track to play next, comparing what I heard to what I’ve heard before. There’s nothing that these speakers can’t play. Big, or small, loud or soft, acoustic or electric. No limit. And that’s part of what $250k buys. The SEs do it all: they sound great at bone crushing levels, yet even at conversation level, they still sound fantastic. Yet they create a sound field that is so dense and full of musical information, as you slowly advance the volume level it’s easy to perceive the level at which you become totally immersed in the music – the point at which you become the music. The SEs provide a transparency and coherence of your favorite ESL, yet they have the punch of a cone speaker and the weight to convince you. Because each pair of SEs is built to order, any special finish requirements can easily be accommodated. The other part of the equation is the level of detail that is paid to every single aspect of all Sonus faber speakers, but even more so in the SE. The level of craftsmanship present here is unmatched by any other speaker manufacturer. 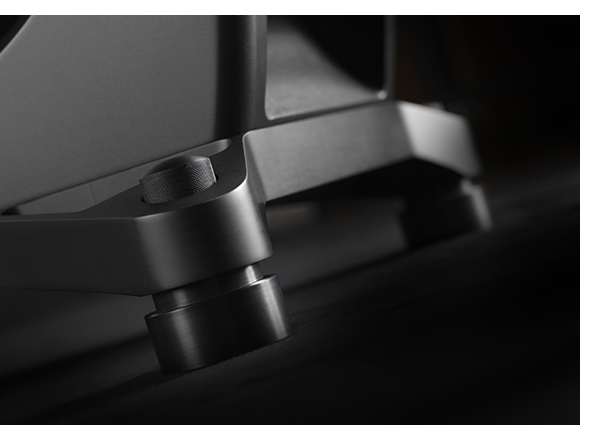 Sonus fabers’ craftsmanship is everywhere, from the leather neatly wrapped around the front and rear panels, all the way down to the suspension and feet in the base. No detail is left unfinished to epic proportions. As much as I’ve tried to fill you in on what these spectacular speakers sound like, I still feel my words come up short. Should the SEs be on your radar, it will only take about 90 seconds into your favorite track to fall under their spell. At that moment, you will know everything. Please note that all TONE Audio copy and photography is © 2005–2018 TONE Magazine LLC. This RSS feed is provided for personal, non-commercial use only. TONEAudio MAGAZINE. All Rights Reserved.